A gorgeous cas Christmas card Sylvie. I love the tree die and the wow design. 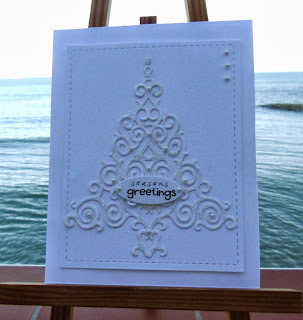 Gorgeous card Sylvie, the die cut tree looks fantastic. I hope you have a lovely time with your friends. This is gorgeous Sylvie...sounds like you have the perfect weather for Christmas trees! Enjoy all that sunshine! Lovely card Sylvie. Glad you remembered the wax paper - works a treat eh? Sounds like your friends are going to have a lovely time. BTW I think you've placed the sentiment perfectly. That is a gorgeous die - I'm glad you figured out the wax paper because I think I would run the other way from the details in that die!